This just might be the greatest addition to any St. Louis home. When you choose to purchase a beautiful custom spa or hot tub, be prepared for friends and family to spend large amounts of time at your home. We think that sounds great too! So choosing to get a concrete spa or portable hot tub is definitely a no brainer. The biggest decision you will need to make is, which one do you choose? Scarlet Pools portable hot tubs and concrete inground spas each have their own perks but it will boil down to what is most important to you when deciding which choice to make. Below we will give some information to help you understand what exciting features you will get to choose from when speaking to Scarlet Pools customer service team about making your backyard the envy of the neighborhood. What makes an incredible inground concrete pool even better? An attached custom concrete inground spa, that’s what! The features for an attached spa will typically match the inground pool as far as tile, finish, and shape is concerned. Scarlet Pools hot tub and spa customers will get some interesting options when it comes to incorporating the spa into the pool. You could choose to have a spillway which allows for the pool and hot tub to recirculate the same water, which could transform your spa into a nice relaxing area for sitting in cool water. When you want to crank the heat up a little bit, it couldn’t be easier with just a quick adjustment to the spa water level. This spillway can really be transformed using ledges, benches, rock formations, waterfalls, and honestly, we could keep going for a really long time on all the features that are available to our customers! Be sure to speak with your customer service representative about your dream concrete spa and pool combination to hear what we can do for you. Winter is the best time to build your custom pool ! The features available on a custom concrete spa are pretty amazing when you sit down to design it. This is the major perk of going with a concrete spa, Scarlet Pools can literally do anything to a spa that we can do with an inground pool. Our design team has the knowledge, our builders have the power, and our suppliers have the best materials in St. Louis to supply our customers with the greatest that inground concrete spas can offer. When meeting with our team, we will cover the options available to you from state of the art LED lighting, authentic rock waterfall formations, intricate tile, smooth durable finishes, and so much more. There may not be a more relaxing pair of words in the English language than “spa jets”. Let’s get excited though, because at this stage of the design our customers get to make the decision of what kind of jets they would like in their concrete spa. Our suppliers have a large selection to choose from including spinning storm jets, cluster jets, large jets, and much more including our personal favorite the massage jets. Can’t decide on one? Well, that is why you are choosing to have a custom inground concrete spa, because you don’t’ have to. 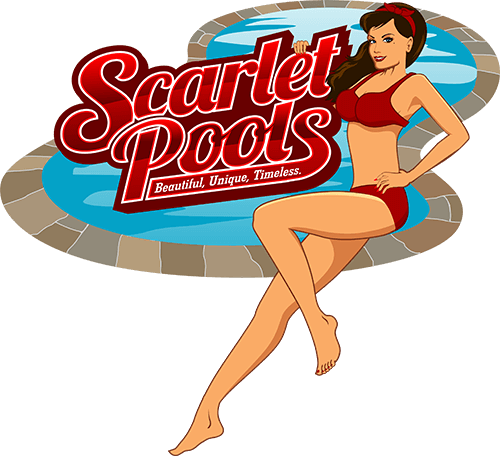 Scarlet pools hot tubs team can help you pick out and install a portable hot tub purchased from the best in the business. Our process for portable hot tub installation consists of meeting with the customer to find out how they would like to make their hot tub really stand out above the crowd with a permanent fixture. Our options for these fixtures range from brick, stone, concrete, tile, rock, and even coping that can go around the top of the portable hot tub. All panels will still be accessible and in the future upgrades are possible without removing the entire fixture. Let us know if you have an existing hot tub that needs a little bit of spring in its step to bring more value and excitement to your home or you are looking for something new with a portable hot tub installation.